Yesterday was a domestic disaster.Â I got home and discovered that not only was my phone service out, THERE WAS NO DSL!!! Which, of course, meant no Internet.Â A house is simply not habitable without Internet access (oh, how quickly we get accustomed to our little luxuries! ), and more to the point, there was no way to have my Skype (Internet VoIP) teleconference without Internet access.Â I wouldn’t even be able to view the website we were reviewing! So I quickly rescheduled the meeting, set up an appointment with the telephone repairman, and did the only thing possible under the circumstances: weaving! I took my problem-child warp and carefully advanced it, inch by inch, until all the warp was wound onto the front beam and the tangles were back to the end stick.Â Then I carefully cut the end loops (which were pretty uneven at this point), combed out the last of the tangles, and re-tied the warp to the end stick, keeping the tension even.Â Finally I rewound the warp onto the back beam.Â This worked out all the tangles and produced a wonderful warp with remarkably even tension. As I had more or less expected, the garnet weft blends into the brown warp, obscuring the pattern somewhat – the curse of using high-contrast stripes in the warp: whatever you use is going to blend into one or the other! 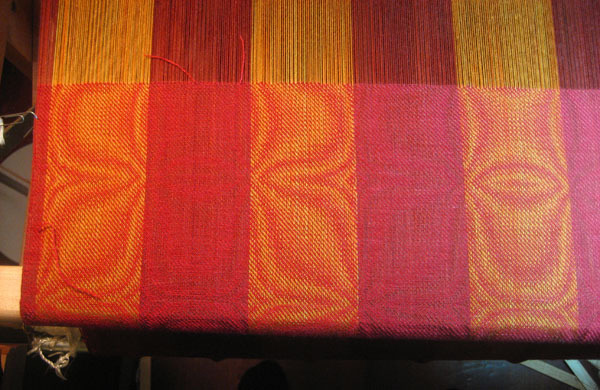 – but it looks quite pretty.Â I can’t wait to finish, cut it off the loom, and compare it to the goldenrod-weft shawl!